Well, I suppose it’s about time that I start giving a virtual tour of our new home. Y’all were so patient and encouraging during the building process and now that we’re getting more and more settled in, I’m feeling ready to start sharing some rooms. 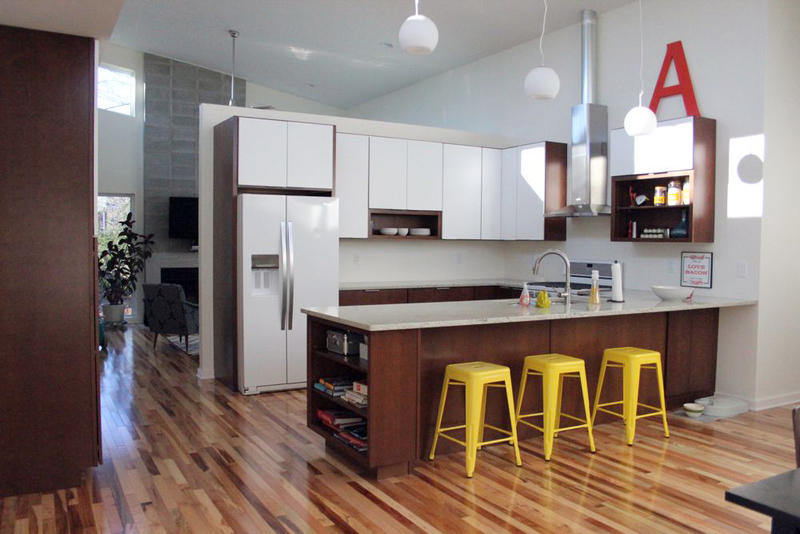 Let’s kick this thing off with the kitchen, which is quite possibly my favorite room of the house. I’ve been challenging myself to take over more of the family cooking and I’m starting to really enjoy it…due in part to how much I love the functionality and atmosphere of this room. 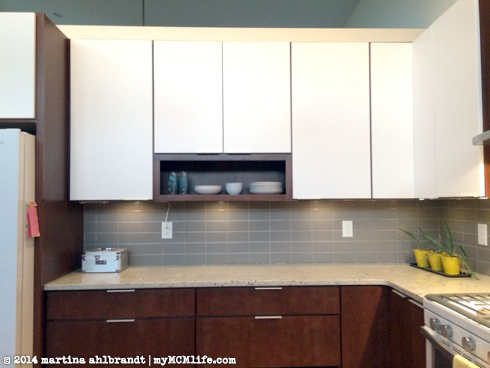 Everything ended up just like my plan with a few additions thanks to our friend Andy at Markraft Kitchens. When I walk through the front door, this is my view of the kitchen. 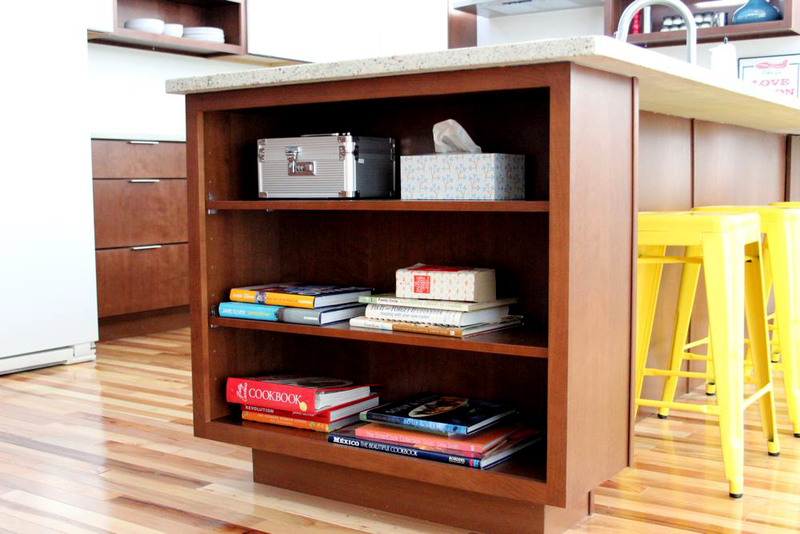 Having an open shelf for cookbooks was on my dream kitchen wish list. We also have a medicine lockbox (DCS requirement) for our daily vitamins and tissues. Ali won’t leave anything on this shelf alone. 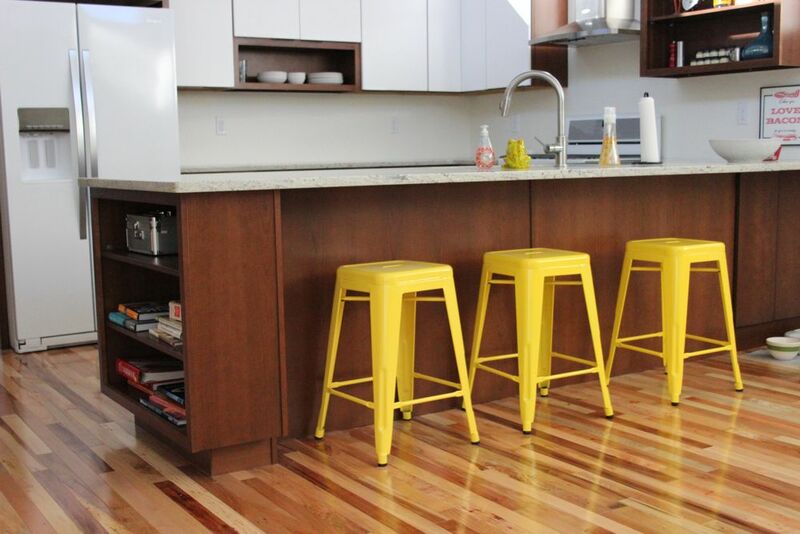 I was originally going to get silver stools but I decided we needed some color up in here. 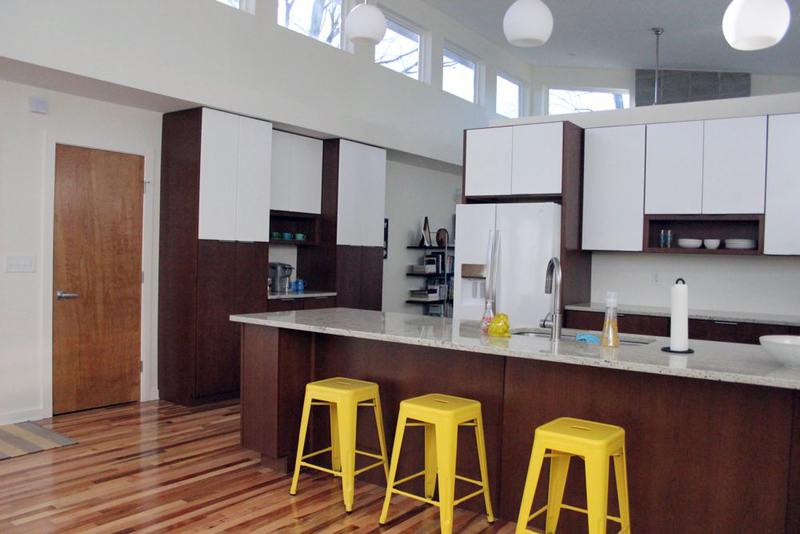 Our countertops extend out about 12″ there for casual conversation with friends while we’re cooking. 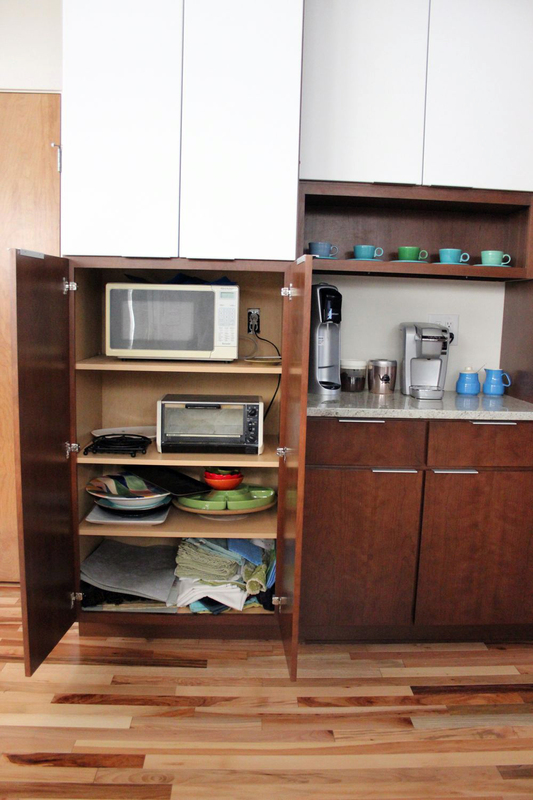 Another dream kitchen wish list item: a corner cabinet facing out under the bar toward the dining room. 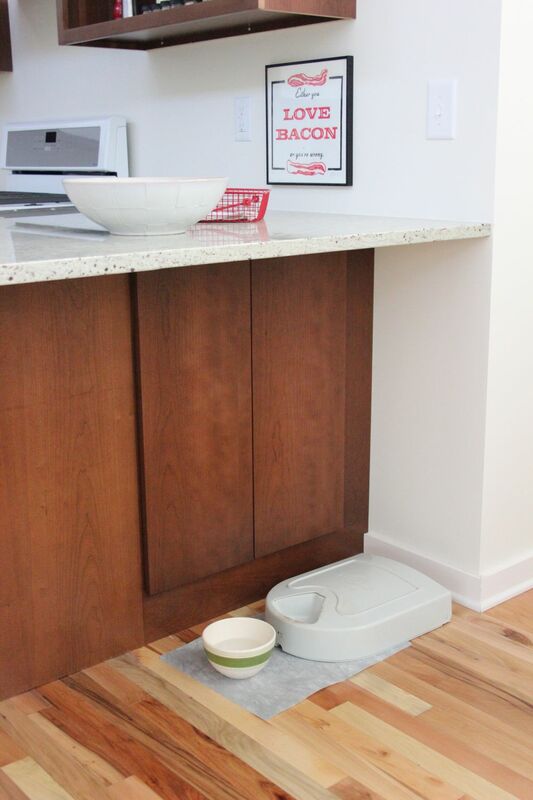 It ended up being the perfect spot for Lucy’s food and accessories, and her water bowl is very close to the sink. Perfect. 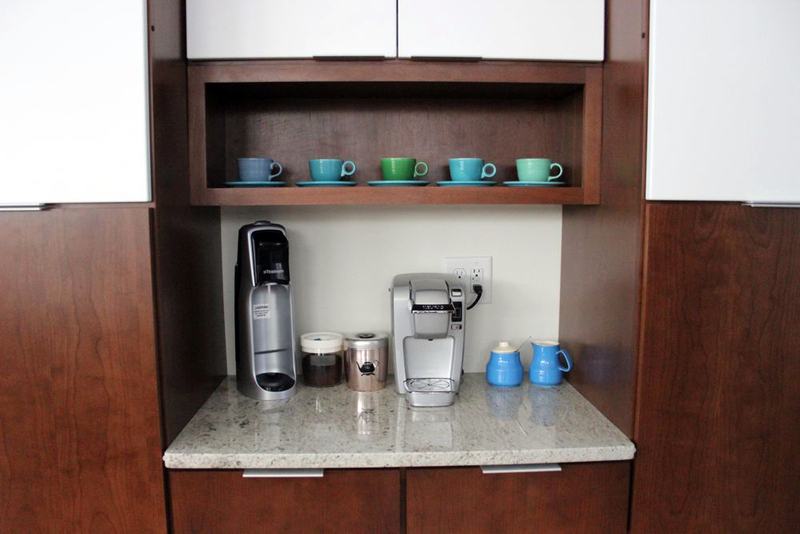 This section of cabinets is the pantry, coffee/tea bar and home of the small appliances. Another dream kitchen wish list item. 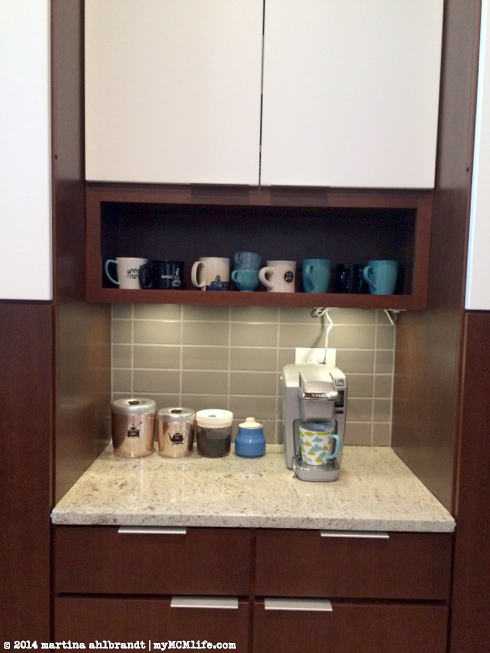 This coffee/tea bar turned out even better than I had envisioned. We use this everyday, many times a day. I prefer to keep my microwave and toaster oven hidden so he’s where they live. I’m so glad that Andy, our cabinet guru, found a way to make this work for us. That door there is our coat closet. We’re planning to add a tile backspace eventually. I really love the light we get in this space. Our architect, Ryan Thewes, was so thoughtful and thorough with his planning of window placement. 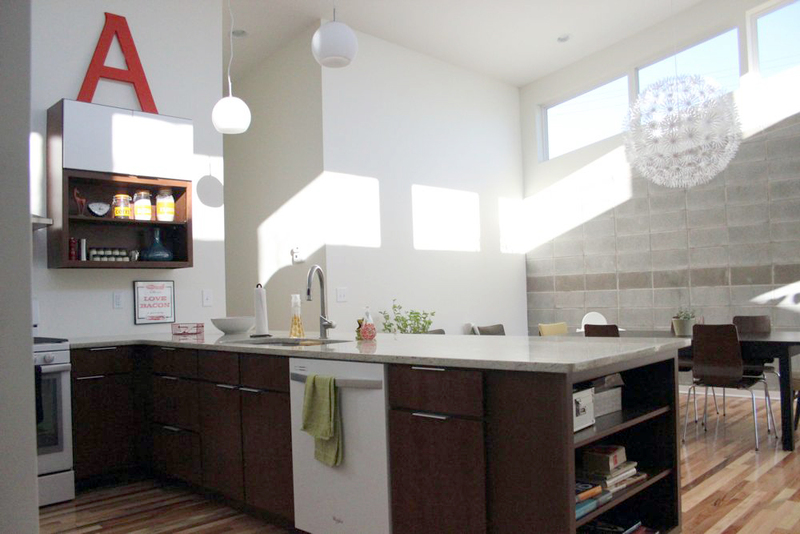 The clerestory windows let in a ton of light, mostly indirect. We never need to turn lights on during the day. Besides the cookbook shelf, one open shelf for our everyday dishes and glasses was at the top of my dream kitchen wish list. BAM. Exactly how I wanted it! 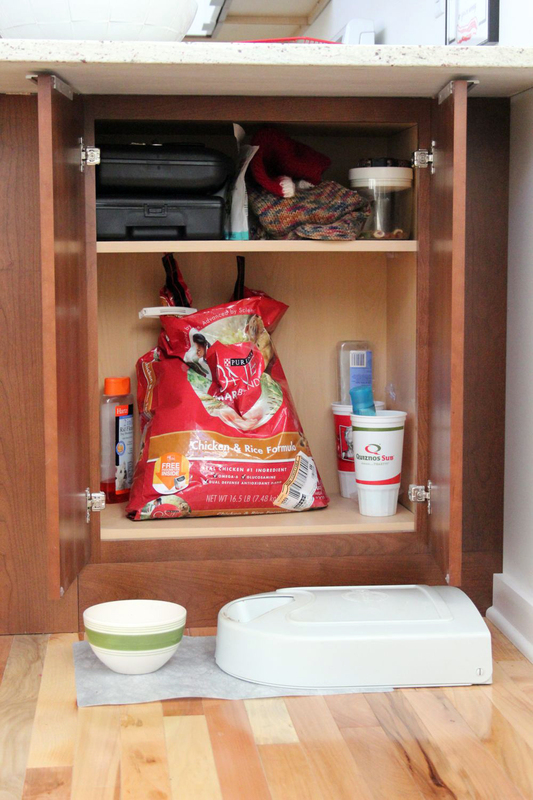 This was a last minute addition to our kitchen plan: a pull out drawer for the trash and recycling. I’m so glad we did this. It’s really practical and I like that it’s close to the front door (the one on the left) where we walk in with the junk mail and go out with the trash. I’m getting used to cooking with gas. 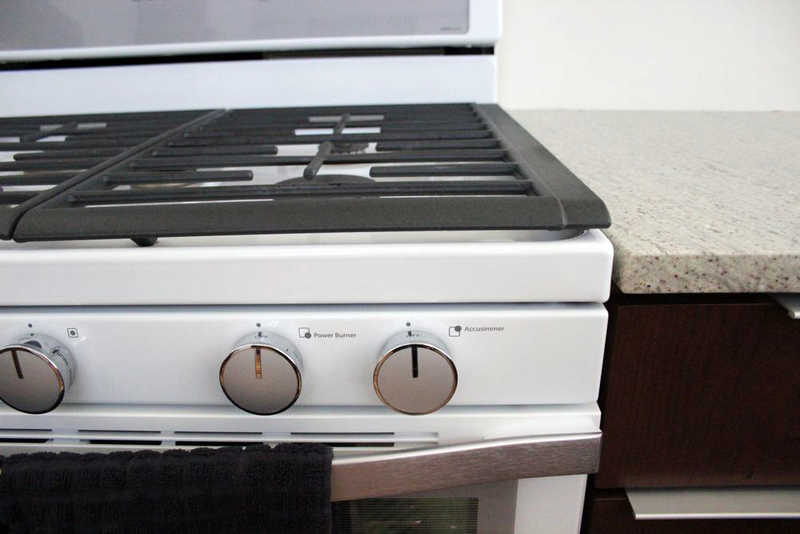 My favorite part of the Whirlpool White Ice gas range is the knobs. So that’s it, my dream kitchen! If I skipped anything you’re curious about, just ask! I’m loving this fancy pull out trash and recycling drawer! There will be doors on the corner cabinet up there, they just didn’t have the right hinge with them. Those upper cabinets of the pantry will have white doors sometime this week. Ali knows this is her room. She runs up the pink wall and slaps her hands on it, babbling incoherently. I think she approves. I love the white ice appliances in our house as much as I did in the store. I’m realizing I haven’t taken many new photos of the laundry room or Jason’s studio – those were the last rooms to have the flooring finished. I also haven’t photographed the bathrooms lately. We did have one little snafu with the tile in the master bathroom. We didn’t order enough the first time around so we had to get some more. The tile company sent the wrong color and the tile guy installed it anyway. (What the ?!) So that needs to be scraped up and the tile company promises the new tile will arrive by the end of this week. So, no big deal but a small set back nonetheless. It may or may not be fixed by moving day, but it will be fixed soon. I also might have printed out the kitchen plan elevations from our cabinet guy and sketched in notes about what I’m going to put in which cabinets. 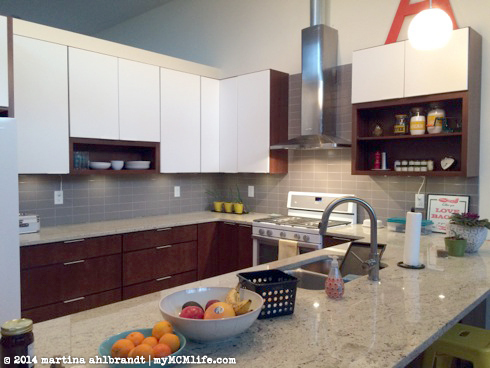 (First post about our kitchen plan is here.) It helped me to notice a few things, like that I wanted to add a pull out drawer for the trash and recycling near the end of the peninsula. Our pantry will surround a coffee/tea bar area. This open shelf at the end of the peninsula was one of my dream items. I’m also very happy about the counter overhang that will allow space for a few bar stools and that cabinet on the right corner that’s accessible from the dining room side—it seems like the perfect place to store Lucy’s dog food and dishes. 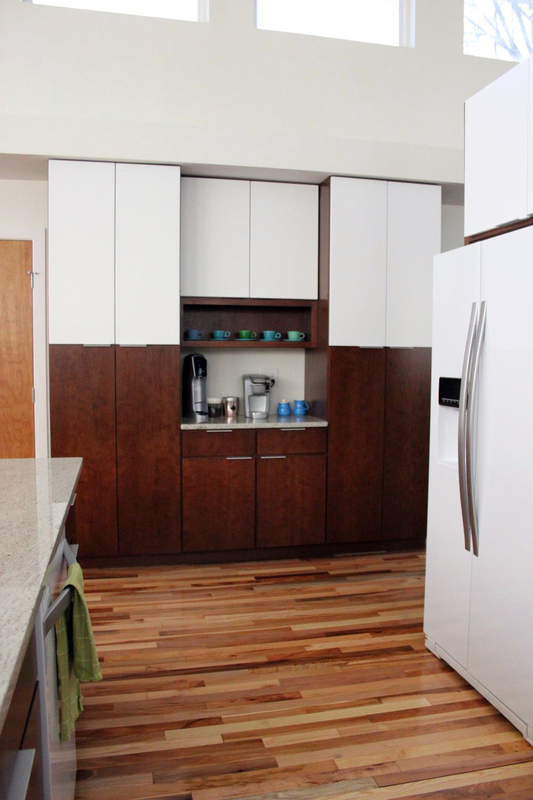 Basically, I want walnut-stained wood cabinet doors on the base cabinets and white wall cabinets. 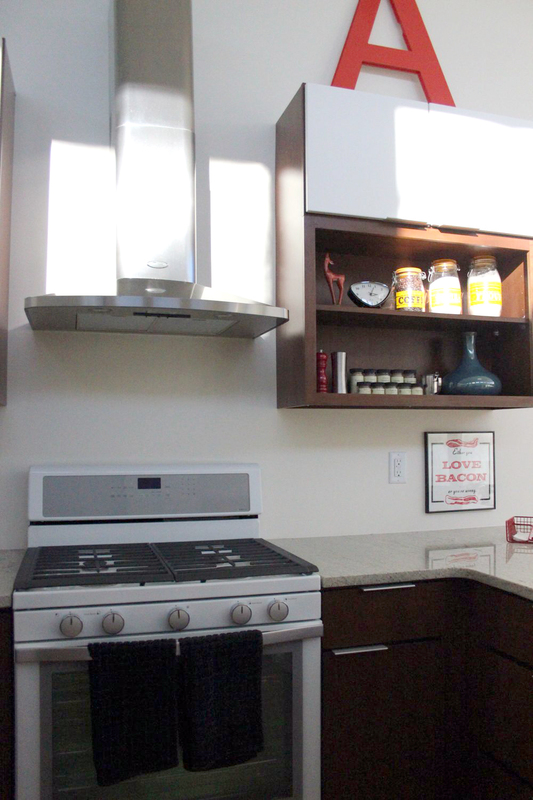 Somewhere on the same wall as the refrigerator, I want a small open shelf for our everyday dishes and glasses. Plus, a whole lot of specifics that won’t matter to anyone but us. Source: designsponge.com via Martina on Pinterest. The good thing about our house taking so long is that we have time to change our minds about things as many times as we want. 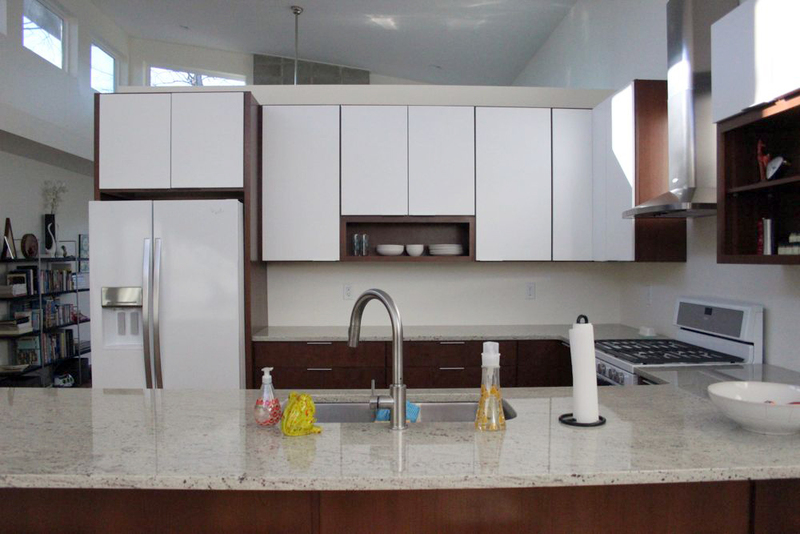 For example, at first we thought we wanted all white cabinets. Now we want half white, half walnut. 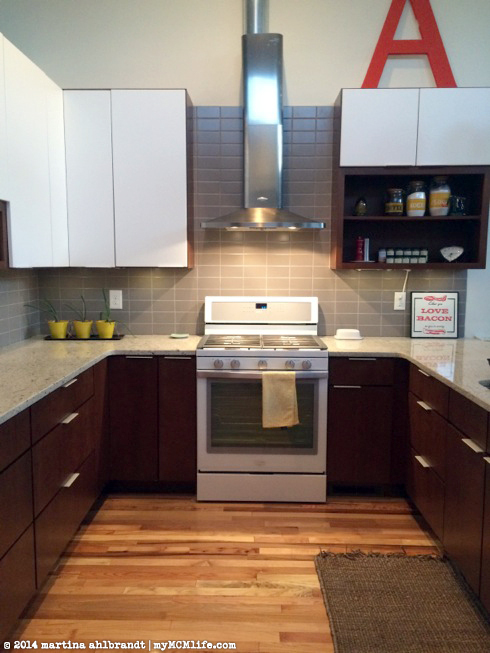 We thought about doing soapstone countertops or concrete countertops…now we’re set on kashmire granite. One Friday night we went on a fun family outing to the appliance store to look for a refrigerator, dishwasher and range. We don’t need to purchase them for a while but we figured it would be helpful to decide what we want to get, especially since we had to order the range hood for the HVAC guy. We know we want to get a gas range. They scare me a bit (thanks to our first apartment and its ancient gas range that almost blew up the house…) but Jason is more of a cook and he’s set on it. If he’ll cook more, it’s all fine by me. He assures me that a new gas range will not almost blow up our house. 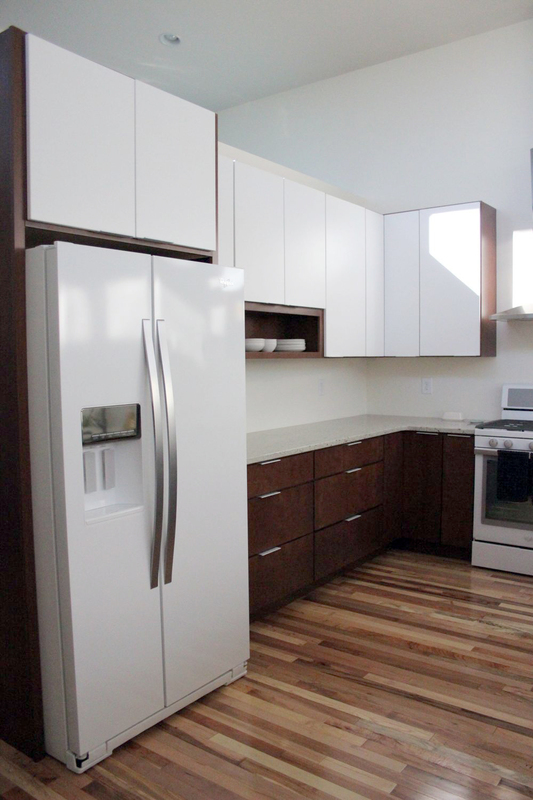 Beyond that, we know that we prefer a side-by-side refrigerator/freezer to the popular french door model. We just assumed we’d get stainless. That’s what we had in our last house. That’s what you put in new houses. But then… Then, we saw this. 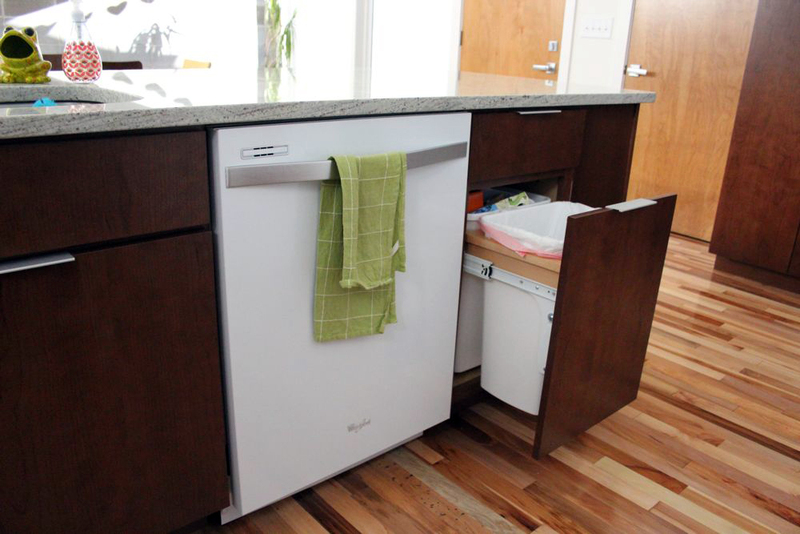 We had a few irritations with the stainless appliance at our last house: 1. they scratched easily, 2. drip marks were constantly appearing on the dishwasher and the freezer door below the water dispenser and 3. toddler hand prints. I can’t say for sure that these won’t scratch or show drip marks but it sure doesn’t seem like it. We asked Ali to test irritation #3 and she was happy to oblige. NO TODDLER HANDPRINTS! Yay! I’m sold. We walked all around the store looking at other stainless appliances but I couldn’t get White Ice out of my mind. We haven’t purchased them yet, as I mentioned, but we will be. 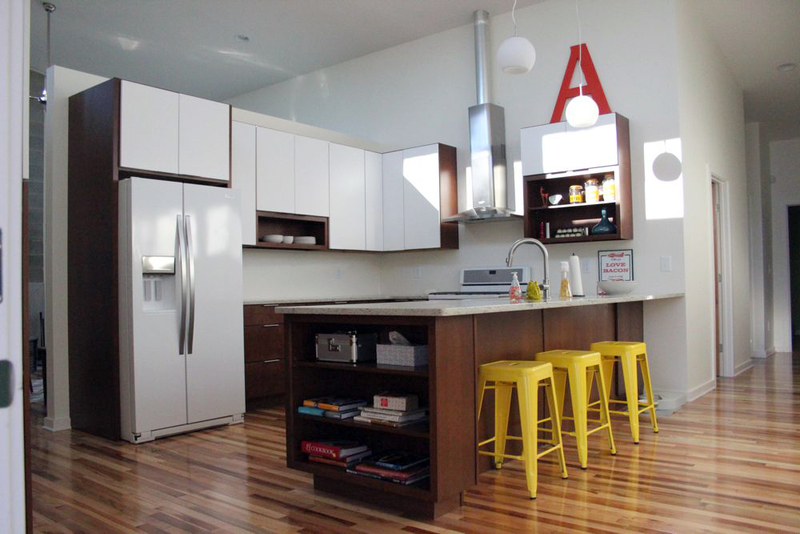 I have a Kitchen Inspiration Board post coming soon. I wish I had more exciting news to report. I was really hopeful that we’d be breaking ground this week. We’re working things out with the bank, trying some different options to see who/what/where will be a good fit to finance our new home. In the meantime, our contractors have the building permit in hand and are ready to go as soon as we close on the construction loan…which could be a few more weeks. Boo. We’re really eager to start moving forward. I have some samples of countertops and wood flooring on my desk. This is honed granite, which is an option we’re considering for the kitchen countertop. The wood sample is hickory. Jason picked it up at the hardware store because he likes the fine, straight grain and the variation of colors. I do too. We’re still quite a ways away from needing to make those decisions but we’re looking at options as much as possible now so we can decide quickly later on.